Scarlett 18i20 (2nd Gen B Stock) | Focusrite Audio Engineering Ltd.
Focusrite Scarlett 18i20 is the perfect rack-mountable centrepiece to your studio. With a total of 18 inputs and 20 outputs, record anything from a drum kit to multiple instruments, vocals, synths and keyboards. Scarlett 18i20 features eight natural-sounding combination input Scarlett mic preamps, roundtrip latency of 2.74ms*, 24bit/192kHz, eight ADAT inputs, eight line outputs, two main monitor outputs and two headphone outputs. Recording Software Included. Very impressed with the 18i20! It's extremely versatile and excellent quality. Wouldn't expect less from Focusrite. So far exactly what I needed and as advertised. I am in love with this interface. I was hesitant at first to commit to a new product because I became overly familiar with my last interface, but this 18i20 has proven far simpler to use than anything I've used in the past and I don't see myself purchasing anything to replace this for years to come. Great results with minimum effort – plus the assurance of superb mono compatibility and no artefactslso, get $100 off any NUGEN Audio store bundle. Eight natural-sounding combination input Scarlett mic preamps deliver exceptional headroom, loads of linear clean gain, low noise and minimal distortion. The two inputs on the front panel feature newly-designed instrument inputs with extended headroom. The ADAT expansion ports allow you to add an extra eight analogue inputs and outputs, particularly useful for anyone who wants to record higher channel counts and integrate lots of outboard gear. 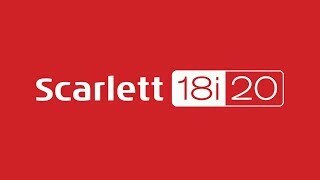 When it comes to outputs, Scarlett 18i20 delivers full routing and monitoring flexibility. There are two dedicated TRS jack outputs for studio monitors featuring anti-thump circuitry, plus eight more analogue jack outputs, two stereo pairs providing mirrored independent headphone outputs on the front panel. With MIDI connectivity, you can also integrate your favourite hardware synths with your DAW. Wordclock Out is also on hand for sync'ing to external devices.